After this Sunday there is one more game. The one that everyone is striving for. The Super Bowl. Players dream their entire lives of paying in the big one. But today. Today is when the legends are made. Today is the money round. The Drive. The Catch. Those did not happen on Super Bowl Sunday. They happened in the Conference Championships. The Seattle Seahawks and the Green Bay Packers are up first in Seattle. The Seahawks are fierce at home, the ’12th man’ not a small reason why. Few believe the Packers with a limping Aaron Rodgers have much of a chance. Then again, Rodgers is the best quarterback in the NFL today. That is not the reason I believe the Packers will pull it out, no the Pack will win because of Eddie Lacy. I watch Lacy run and I do not see Eddie Lacy, I see ‘Sweetness’. Something about the way he moves and spins and throws himself into the end zone simply makes me think of the great Walter Payton. It is the presence of Eddie Lacy that will let Rodgers be Rodgers and lead his team to victory. In the evening we have Andrew Luck versus Tom Brady. Some seem to want to connect this game to the Indianapolis Colts-New England Patriots rivalry of the past. It simply does not fit. That was Peyton Manning against Brady, two titans facing off. The teams are different, the showdown is different. Now it is the a question of the changing of the guard. Andrew Luck is the future, clearly. The question is if the future is now? 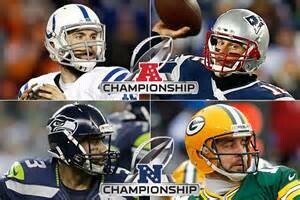 Luck has been special during this years playoffs and he will need to be special again to upset the Patriots. The more important factor is the Colts defense. Last week they played phenomenal against the Denver Broncos and Mister Manning. Can they do it again? If they can prevent yards after catch today they can limit the Patriots offense. Outside of Rob Gronkowski there is not one receiver on the Patriots that should concern the Colts deep, but stopping Gronk is a tall order. No one can predict what will happen today. If they say they can they are liars. Time to sit back and enjoy.